Praise, worship, Bible teaching, prayer, and fellowship. Join us for a time of worship, hearing from God's Word and prayer ministry. After the worship service, you can ask Pastor Mary questions. By appointment. Please call first. Craighouse (954) 491-7270. 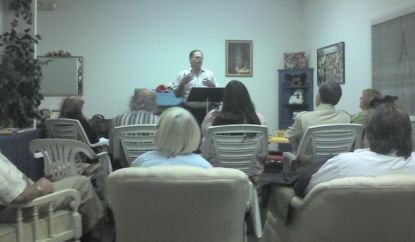 Wednesday Night Bible Study with Pastor Mary Craig. Friday Night Bible Study with Pastor Mary Craig. ° Every war has weapons. The Christian's weapons are spiritual. ° Every believer can be better equipped by taking up the weapons of our warfare, things like the Word of God, the Blood of the Covenant, prayer, fasting, the armor of God, the anointing, holiness, and many, many more. ° Learn the means of grace and how to utilize them effectively. ° Fight the good fight of faith with the weapons God has provided. DFD has been the best-selling discipleship course for over 40 years, at least. My husband Jim and I went through this course as new believers. The impact of the training transforms. Maybe you've come to the place where you realize that only the Living God can satisfy your deepest needs. Maybe you're searching for truth; maybe you're new to faith in Jesus: maybe you've known Christ for many years and desire to help others grow in grace and in the knowledge of Jesus Christ. Examine the great truths of the Bible and your response to these. 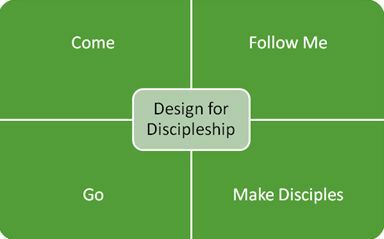 Learn and practice the essentials of discipleship. The Navigators, experts in discipleship training, designed it to be interactive, with discussion-prompting questions, quotes from Christian leaders, and helpful graphics. This Bible study provides insight and encouragement to both those seeking and those desiring to grow in Christ. Do you have a heart to help others, especially new believers, grow in faith? This is for you. 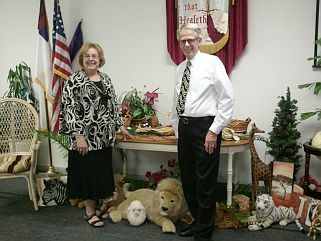 Dr. Craig has been teaching the Word of God since 1973. Now she returns to teach again the study that the LORD used to inspire, to minister, to encourage, to create a hunger for the things of the LORD, and to go deeper and deeper into the Way, the Truth, and the Life. You are in for an adventure as you deepen your life in Christ with Dr. Craig leading as guided by the Holy Spirit. All power is given unto Me in heaven and in earth. Go therefore and teach all nations, baptizing them into the name of the Father, and of the Son, and of the Holy Spirit; teaching them to observe all things whatsoever I have commanded you; and, lo, I am with you always, even unto the end of the world. Amen. Matthew 28:18-20. …repentance and remission of sins should be preached in His Name among all nations, beginning at Jerusalem, and you are witnesses of these things. And behold, I send the Promise of My Father upon you… Luke 24: 47-49. Come when you can; leave when you must. Go to www.mcmtffr.org for audio messages and Friday group study handout sheets. Craighouse® Christian Fellowship is a Christian community refuge for those seeking help and hope in Jesus Christ. Craighouse exists to offer refuge, times of refreshing, and restoration to the spiritually orphaned and wounded of the Christian community in an atmosphere of grace. Craighouse purposes to present the truth of Christ in a paradigm for living by the Word and by the Holy Spirit. Craighouse aspires to minister the resurrection power of Jesus Christ through worship, witness, the Word, and the Holy Spirit to those God brings to its doors. 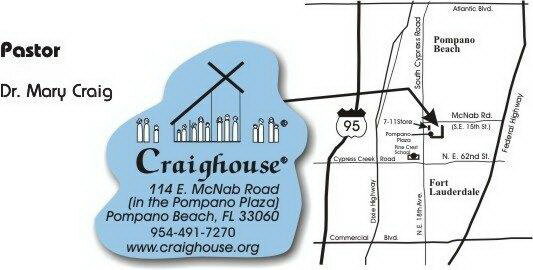 "People bringing people to help and hope in Jesus"
Craighouse® is located in the Pompano Plaza on the SE corner of S. Cypress Rd. (NE 18th Ave.) and McNab Rd. (SE 15th St.). McNab runs East and West parallel to and south of Atlantic Blvd., and north of NE 62ND St. (Cypress Creek Rd. East).